Xumo Nounjio was born in Bangangte, Cameroon, son of a musician/stylist mother and a doctor father. Surrounded by the wilderness of nature, Xumo spent his childhood among songs, ceremonial rituals and discussions about art. His talent for art and music became evident at a very early stage. Xumo went on to study in the Yaounde Science Faculty and later, in Paris, he studied the History of Art and Architecture. It was there that he explored the influence of urban sounds and recording studios. In 1993 he formed the group Broken Noses and produced his first album (an eclectic mix of rock, afro, punk and jazz), singing in Bamileke, English and French. 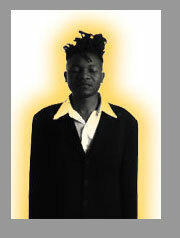 The band travelled around Europe performing, until eventually Xumo settled in Barcelona where he formed his second group Tukupa. 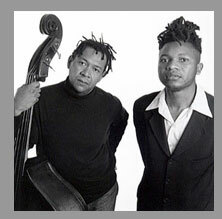 In 1996, Xumo composed and produced an hour of ethnic music for Tukupa. Jim and Xumo met in 1997 and Jim immediately saw the potential for collaboration. Xumo already knew Jim's work with CARMEL and had been a fan since his days as an Architecture student in Paris. They teamed up and began working together. The music was inspired by ancient Bantu tradition, blending improvised and mystical elements whilst still being highly contemporary. They also explored the visual aspect of the work by combining the music with sculpture and performance. Their work aimed to reflect a joint interest in ancient African tradition whilst at the same time being fashioned by the practices of modern creativity.